Looking for the best Rome underground sites? Like the catacombs, the Colosseum, and the source of the Trevi Fountain? Find out how to see a whole other Rome beneath the surface. Rome has been here nearly 3000 years. Can you imagine it all just staying the same through time? Of course it didn't. It was like a living breathing thing that grew and shrunk, and grew again. Over millenia of flooding, earthquakes, sacking by Goths and Vandals, and other calamitous events, much of ancient Rome is now underground. And lucky for you, you can visit it! There are hundreds, if not thousands, more Rome underground sites that I don't have listed on this page. In some cases, they are simply closed to the public. In others, they are really off the beaten track and/or difficult to visit. If you have a question about visiting an ancient Rome site that you don't find listed on this page, let me know and I'll find out if you can visit it. And just think how many more sites Rome underground sites are yet to be discovered! You probably know you can visit the Colosseum underground. Did you know you can also visit the Tomb of Saint Peter? See where athletes competed in games in a stadium? Visit an emperor's palace with a precursor to the Pantheon? Here are my favorite Rome underground places to visit, along with details about where they are and how you can visit them. The first lists all the sites you can only visit on a tour/with a guide. The second lists underground Rome sites that you can easily visit on your own, without a guide. At the bottom of this page, you will find a map of all the Rome underground sites on this page. N.B. - Most of these sites do not have a minimum-age restriction, so assume there is none, unless otherwise noted. I am often asked if you can see these amazing secret Rome underground sites without a guide. When you visit the Domus Aurea, you will wear hard hats, and you will be led by one of the archeologists working on restoring this amazing Rome underground site. One big reason is that these sites are delicate, and can only handle a few visitors a day. A guide will make sure you stay on track, and don't touch anything, or take photos when it's not allowed. Another reason, in some cases, is that you need a guide or you will not be able to make your way, or have any idea what you are looking at. I'll tell you how to book the on-site guide when possible, and also how to book a tour with an outside tour company if that is also an option. One more thing - almost NONE of these tours is eligible for discounts or free entry with the Roma Pass or any other City Pass. Assume the Rome underground sites on this page are included unless otherwise noted. How did they get lions onto the arena of the Colosseum 2000 years ago? They did not just walk in through one of the gates, I can tell you that. When you visit the Colosseum in Rome underground, you will also visit the arena floor. From here you can imagine what it was like to be a gladiator, waiting underneath to come up and fight, and once on the stage, to see all the Roman spectators watching from above. To add to the entertainment value of the events that played out daily at the Coliseum, the arena was often set up as a stage, and the participants (combatants or victims) were brought up from underneath the Colosseum floor, appearing as if out of nowhere. Replica of the pulley-system elevator used to hoist animals and people up to the Colosseum arena in Ancient Rome. On a tour of the Colosseum Underground, we got to see how these crane bases were used to manage the elevator pulley system. So, while the spectators enjoyed the spectacle of whatever activity (hunting games, gladiator battles, executions, and other gory events) took place, the participants awaited their turn/fate in the dark, cramped, stinky, loud cells below. This is a reconstruction of the trap door that would have been used to bring animals and people up to the arena when they held games at the Colosseum in ancient Rome. When it was their turn, they got onto (or, in the case of animals, were loaded onto) a pulley-system elevator, which brought them right up onto the floor through a trap door that was otherwise hidden from spectators' view. On a visit to the Rome underground of the Colosseum (also called the Hypogeum), you can see the labyrinthine structures where people and animals were kept before coming out onto the Colosseum floor. Visiting the Colosseum Hypogeum (underground) is high on the top of a lot of people's lists. And it's often hard to get tickets, because space is limited. So book early, and don't miss this fabulous site. How to book: Either on CoopCulture or with a tour company. To book visit my page here. Opening Hours: Daily 8:30 am–7 pm. Earlier closing hours in winter. Closed December 25 and January 1. The underground tour is not available on dates when there is free entry to the Colosseum. Minimum age: Children under 12 must be accompanied by an adult. Do you have to go with a tour? Yes. You must go with a guide because there is a set route to follow, and you have to stay on track. There are also parts that are simply off limits and your guide will make sure you stay together and in the right spots. Saint Peter's Basilica (the Vatican) is named for the apostle, who was the first Pope. Did you know that the location is based on the site where Saint Peter is said to have been buried after being executed by Nero in Rome? No photos are allowed on this tour. This photo is widely available on the internet, and is credited to the Fabbricato di San Pietro, the official entity that manages the site. Deep below the surface of Saint Peter's dome, lies what is said to be the tomb of the apostle. So definitely book in advance, and enjoy this truly amazing Rome underground site. Where: Swiss Guard Gate on the left-hand side of Saint Peter's Basilica. How to book: You can book via the Vatican, or through a tour agency (much more expensive). Visit my page all about this amazing site to find out all the details. Opening Hours: Daily from 7:00 a.m. to 7:00 p.m. April to September and from 7:00 a.m. to 6:00 p.m. October to March, except on Wednesdays (if there is the papal audience the Basilica remains closed until 12:00). Tickets: 13€ if you book through the Vatican and, 59€ if you book through a ticketing agency. Do you have to go with a tour? Yes. You will go with a guide working for the Vatican, who will give you all the history, take you through the different rooms, and make sure your group stays together and does not take photos. The Domus Aurea is one of my absolute favorite hidden Rome underground sites. I have seen it several times over the years, and each time am left gob-smacked. Inside the vast complex of the Domus Aurea, one of the most amazing Rome Underground sites, you'll see intact frescoes, vaulted ceilings, and much more. The Domus Aurea was part of a humongous party palace the Emperor Nero designed for himself. Today you can really get a sense of this incredible complex from ancient Rome. Many rooms and frescoes are intact. You feel transported back in time and into this man's mindset as you tour the place. In ancient Rome, this was a massive complex, full of gardens, porticos, lakes, and much more. This octagonal room in Nero's Domus Aurea is clearly a precursor to the Pantheon, which would be built around 50 years later. So they filled it all in with rubble (which preserved it), and built stuff on top. It finally came to light in the Renaissance, and now, you can visit it. Read all about the Domus Aurea, and how to visit it, here. Where: Via della Domus Aurea, 1. How to book: On CoopCulture or with a ticketing agency (below), or take a tour that includes the Colosseum. Opening Hours: Saturdays and Sundays 8:30am–5pm; On Easter Sunday hours might differ. Tickets: 14€ on CoopCulture (plus 2€ booking fee), more if you use a ticket agency or tour. Wheelchair accessible? According to the Domus Aurea official website, CoopCulture, "The site is partially accessible to the disabled with wheelchair." Do you have to go with a tour? Yes. You will go with one of the archeologists that is currently excavating the site. You will wear hardhats throughout the tour. This is another one of my favorite Rome underground sites. Right next to Trajan's Column, they found the ruins of an 18th century nobleman's home. But underneath that, there are stunning ruins of elegant homes of wealthy Romans from Ancient Rome. And the way they have set it up to tour is fantastic. Photos of the Domus Romana at Palazzo Valentini are not allowed. This photo is from the official website of Palazzo Valentini. You begin with an introductory video to the site. Then your guide will take you beneath the surface, and through the different rooms, many of which have intact tiled floors and frescoes. It's a wonderful experience but if you suffer a little bit from vertigo, make sure you stand next to a wall so you can hold it or lean on it. Sometimes the whole space goes dark, and they light up just one thing beneath your feet. So it's very entertaining and immersive, just make sure you don't get dizzy. How to book: Tickets can be booked and purchased via Call Center and on line. Opening Hours: Wednesday – Monday 9:30AM–6:30PM, Closed on Tuesdays and December 25, January 1, May 1; On Easter Sunday hours might differ. Tickets: Adults 12,00 € (for reduced prices and free admissions visit the official website). This site does participate in the Roma Pass. Wheelchair accessible? Disabled or physically impeded visitors are recommended to inform the call center and book the entrance. Do you have to go with a tour? Yes. First, you will watch a movie in the language of your tour (English is one of the languages available). Then your guide will take you through the site. You need a guide partly because, frankly, it can be disorienting. There are really cool light shows but they can leave you feeling dizzy. The Basilica of Saint Mary Major (Santa Maria Maggiore in Italian - the biggest church to Mary in Rome), is one of my favorite churches of all time. It's a stunning example of a 4th century Roman structure and like so many churches in Rome, the basilica you see today is built on top of Ancient Roman stuff. When I took this Rome underground tour of Santa Maria Maggiore, I was already thrilled to see the frescoes, the tiled floors, and the intact structures. What blew me away was when the guide told us what we were looking at: the entire structure that you can visit underneath Santa Maria Maggiore was once a calendar in Ancient Rome. Yes, a giant calendar, made up of rooms with stories told on the walls, to depict each month. Awesome in the true sense of the word. Where: Piazza di S. Maria Maggiore, 42. How to book: Just show up at the basilica. Staff is standing in the front loggia before you enter the church, and you can book then for the next tour. Tours go regularly, and I've never heard them say they are fully booked. Opening Hours: The basilica is open daily from 7am to 6:45pm. Tickets: 5€ for the tour. The basilica itself is free. Do you have to go with a tour? Yes. You will go with an employee of the basilica. Your tour includes a visit to parts of the museum, and then you will descend into the underground space. It's important to have the tour so you know what you are looking at. It seems when people think about visiting Rome underground, they think of the catacombs. We have many of catacombs in and near Rome. Some have yet to be excavated, some are available only by special permission, and others are regularly open to the public for visits and tours. I snapped this diagram along the Appia Antica. It shows where the three main catacombs are in relation to each other. The easiest to visit, especially if you want to see more than one in a day, are the 3 catacombs on the Appia Antica, San Callisto, San Sebastiano, and Domitilla. How to book: Individual visitors and groups up to 15 persons do not need to book. You can just show up, but you can also book in advance. Opening Hours: Thursday - Monday: 9 am – 12 pm and 2 pm – 5 pm; Closed Wednesdays. Tickets: 8€; More details (concession tickets and free admission) can be found on the official website. Photos allowed? Only above ground and in outdoor or church spaces. Your guide will inform you. Wheelchair accessible? The Catacombs are not wheelchair accessible. Do you have to go with a tour? Yes. Each site has different rules but in general, you can only visit the Rome catacombs with a guide. Most of the catacombs have their own guide. How to book: You can book on-site, or book a tour with an agency in advance. Opening Hours: Wednesday - Monday: 9 am – 12 pm and 2 pm – 5 pm; Closed on Tuesdays. Tickets: Adults: 8€, children between 6 to 15: 5€, children: 5 and under: FREE. The cost of the entrance ticket includes the guided tour. Opening Hours: Monday to Saturday 10 am - 5 pm; Closed on Sunday and on the following feast days: 25th December (Christmas Day), 1st January (New Years Day). Tickets: Standard Ticket € 8,00 Adults; Reduced Ticket € 5,00 (more details on the official website). Where: Piazza di S. Lorenzo in Lucina, 16/a. Opening Hours: Daily 8.00 am - 8.00 pm. Do you have to go with a tour? Yes. It's not that easy to visit the underground of San Lorenzo in Lucina, because you need to visit that part on a guided tour. They regularly offer a tour of the underground on the last Saturday of each month at 4.15 p.m. The cost is 2€. Most tour companies that offer this visit are primarily local agencies offering tours only in Italian. Luckily, you can book this visit with Context Travel, where you will have a fabulous tour of this site, along with a few other sites. 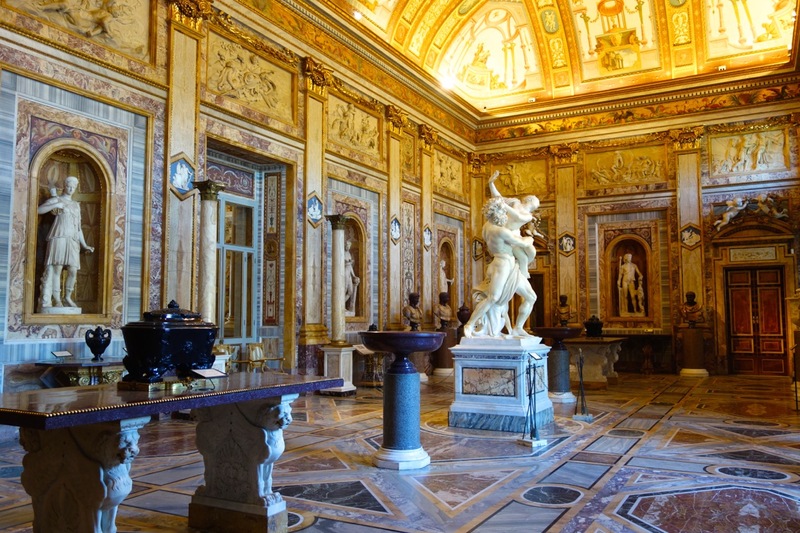 How to book: You can book on the official website, or on Roma Sotterranea, the tour company that has been given the official rights to offer these tours.— the only way to visit this site is to book in advance through them. Group tours can be requested in English, subject to availability, by emailing bunker@sotterraneidiroma.it. Tickets: Guided Tour ticket price € 10 p.p (prices are for groups of minimum 14.) Children under ten visit for free. The below are my favorite hidden Rome sites you can easily visit without a tour or guide. In some cases, we are talking about an underground ruin out in plain sight. In others, you need to buy a ticket. Opening Hours: Thursday - Monday: 10 am - 1 pm and 3 pm - 6 pm; Closed Tuesday and Wednesday. Wheelchair accessible? Parts of this site close to the entrance are wheelchair accessible. This may be one of Rome's most popular creepy sites. I am not sure I'd call it a Rome underground site. The crypt is indeed under the church, but it's above ground. Nevertheless, it's definitely worth a visit. Photos are not allowed inside the Capuchin Crypt in Rome. This is from Wikimedia Commons by stanthejeep. How to book: Purchase tickets on-site, or in advance. Opening Hours: Daily 9 am - 7 pm. Closed December 25, January 1, and Easter Sunday. Wheelchair accessible? Yes, but you need to let them know in advance, because they use an elevator of a neighboring building and need to request access. Where: Via di Tor Sanguigna, 3. How to book: Book online. Opening Hours: Daily 10 am - 7 pm, Saturday 10 am - 8 pm. Tickets: Full ticket € 8.50, Reduced ticket € 6.50 (for more details on reduced tickets and free admission check out the official website). How to book: You can book and pay directly at the ticket office inside the church. You can also book in advance. Opening Hours: Monday - Saturday: 9am - 12:30pm, 3pm - 6pm; Sunday 12pm - 6pm. Tickets: 10€ (for reduced prices and free admissions visit the official website). Wheelchair accessible? Only the main level of the basilica. The different levels under the basilica are not wheelchair accessible. Is it possible to take a tour? Yes. Where: Piazza di Santa Cecilia, 22. How to book: Once inside the basilica, turn to the left and enter the gift shop. That's where you buy tickets to, and access, the underground. Is it possible to take a tour? You can take a tour of the underground of Santa Cecilia and San Crisogono by booking here. You can take a Jewish Ghetto/Trastevere tour, in which you visit the upper part of Santa Cecilia by booking here. Where: Vicolo del Puttarello, 25. Opening Hours: Tuesday - Friday: 11.00 am - 5.30 pm (continuous); Saturday and Sunday: 11.00 am - 7.00 pm (continued). Tickets: 3 €; Reduced 1.50 € (more details on the official website). Take a tour that begins with the underground of "The City of Water", followed by a walking tour of Rome's fountains fed by this water, including its most famous, the Trevi Fountain. Take a small group tour that takes you to underground parts of Ancient Rome beneath Piazza Navona and the Trevi Fountain, and discover things you didn't know existed. Tickets: 10€/5€ (free for under 6s). Where: Piazza della Bocca della Verità, 18. Tickets: Admission to the church is free. To visit the crypt, they request a donation of 1€. Wheelchair accessible? The church is wheelchair accessible, and worth a visit. The underground crypt is not wheelchair accessible. Where: Piazza Sidney Sonnino, 44. How to book: When you enter the church, look around for the guardian. He is an elderly gentleman, often sitting on a chair near the left-hand wall. If you don't see him, walk along the left-hand wall until you are next to the church altar. To your left, you will see a small room. Go in there and look for the custodian. He will ask you for the entry fee of 3€ per person. Opening Hours: Weekdays 7.00am-11.30am and 4.00pm-7.30pm. Wheelchair accessible? The church is wheelchair accessible, but the underground is not. Is it possible to take a tour? The only way to visit this Rome underground site with a guide is to hire a private guide. You'll want to combine it with other things, as this visit won't take much more than 15 minutes. Crypta Balbi is one of the best Rome underground sites you can visit to understand how Rome evolved over the last 2000 years. Source - Wikimedia, photo credit - Sailko. How to book: You can buy your ticket on-site, or at any one of the other 3 participating National Roman Museums. Participates in the Roma Pass and other City Passes. Opening Hours: Daily from 9am to 7:45pm, except Mondays. Tickets: 10€ to visit just this site, or 12€ for a 3-day pass to visit all 4 museums that make up the National Roman Museums: the Palazzo Massimo, Palazzo Altemps, and Baths of Diocletian. Wheelchair accessible? It has a lift access and is partially accessible by wheelchair. Is it possible to take a tour? Yes, you can book this private tour of Rome Underground that includes the Crypta Balbi. The gorgeous flagship Rinascente shopping store in the heart of Rome is already a magnet for locals and tourists alike. Visitors can get some shopping in, soak up the ambiance at the rooftop bars and restaurants, or just check out this cool new vertical department store in Rome's shopping district near the Spanish Steps. The new flagship Rinascente department store in the heart of Rome boasts a fantastic Rome underground site - the remains of an Augustus-era aqueduct. While there are 11 Rinascente department stores throughout Italy (including a second location in Rome), this particular building has become famous for what they found when digging to build the foundations - an Augustan-era aqueduct. Visiting the basement of the Rinascente flagship store in the center of Rome, you can spot one of the best preserved Rome underground sites, an aqueduct from the era of the Emperor Augustus. In 19 BCE, Rome's first Emperor Augustus inaugurated the Aqua Virgo aqueduct, one of 11, that would bring water into the city and supply structures and baths. During the excavations needed to build this shopping structure, they discovered a huge swath of this aqueduct. 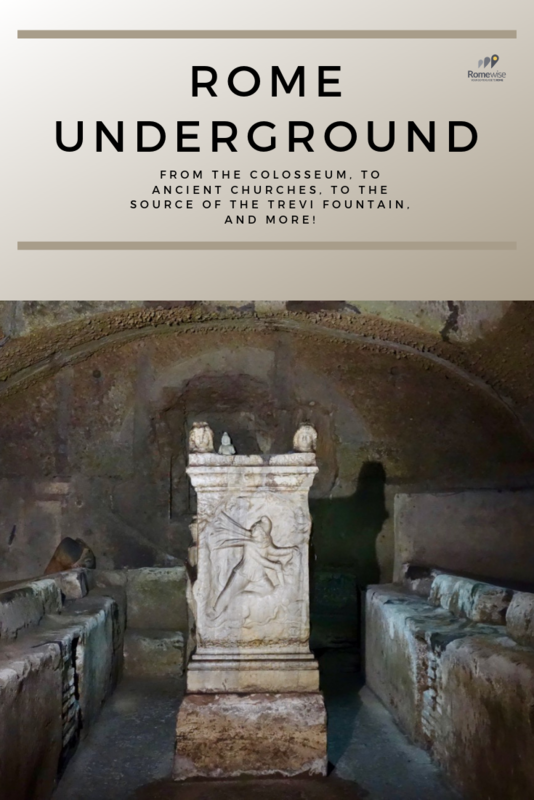 They turned it into a feature of the store, and now you can see it, have drinks next to it, and watch a movie about its history if you like.Head to the gorgeous housewares section in the basement, and you'll find this 60-meter stretch of ancient Rome underground. The "Aqua Virgo" aqueduct still functions today, and happens to be the source of water for the nearby Trevi Fountain. Is it possible to take a tour? You can book a tour that takes you to several sites in Rome underground, including a visit to this ruin.